Content is loading!!! Please reopen the pop-up again to view the content!!!! Resin Cukli Shell Pendant is surmounted by a resin-shell (cukli), signifying virtue, dignity and valor. 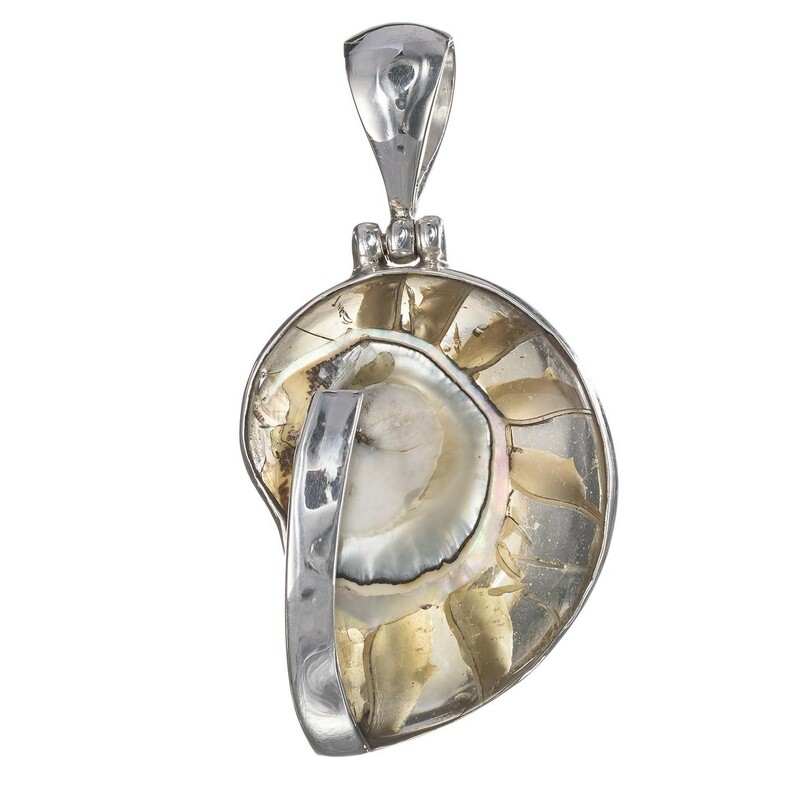 This artisan jewelry is delicately crafted as sterling silver pendant for women. Get ready for an interesting journey through the lens of this silver jewelry taking you places. Read more. Seller does not ship to the entered location. Resin Cukli Shell Pendant is surmounted by a resin-shell (cukli), signifying virtue, dignity and valor. This artisan jewelry is delicately crafted as sterling silver pendant for women. Get ready for an interesting journey through the lens of this silver jewelry taking you places. *Please note that as all items are individually handmade, there may be minor variations and imperfections from one item to another. *Due to natural variation in semi-precious stones, ArtYogi.com cannot guarantee that each item will be identical to the one that is shown, or that multiple orders of the same item would be a complete match. We are constantly updating and revising our offerings of ArtYogi Products, and we may discontinue ArtYogi Products and Services at any time without notice. To the extent that we provide information on availability of ArtYogi Products, you should not rely on such information, and we will not be liable for any lack of availability of Artoygi Products and/or Services that you may order through our site. All pricing for ArtYogi Products available on our site is subject to change without notice. For all of our prices and ArtYogi Products, we reserve the right to make adjustments due to changing market conditions, product discontinuation, manufacturer price changes, errors in advertisements and other extenuating circumstances. We are not responsible for the pricing information provided by 3rd Party Vendors. Upon receiving your order, we carry out a standard authorization check on your payment card to ensure there are sufficient funds for the transaction. Your card will be debited upon authorization being received. The monies received upon the debiting of your card shall be treated as a deposit against the value of the goods you wish to purchase. Once the goods have been dispatched and you have been sent a confirmation email, the monies paid as a deposit shall be used as consideration for the value of the goods you have purchased as listed in confirmation email. Credit Card (Visa, Master Card, American Express, Discover Card), Debit Card and PayPal. Your credit card will be charged when the order is shipped. If we are not able to fulfill your order for any reason after your card is charged, your credit card will be refunded. This policy applies only to products and services purchased directly from ArtYogi, Inc. (ArtYogi). While ArtYogi offers products and services purchased directly from Artyogi on our site, there are many third party vendors offering products and services on our site (3rd Party Vendors). 3rd Party Vendors are also referred to as Seller(s) and Artists/Sellers throughout our site. When an order is placed with a 3rd Party Vendor, ArtYogi is not acting as an agent or principal and the contract is made between yourself and the 3rd Party Vendor and will be subject to the shipping policies and all other policies determined and implemented by the 3rd Party Vendor. If you have an inquiry related to shipping for an order placed with a 3rd Party Vendor, please contact them directly. Our standard processing time is three (3) days after an order is placed for processing and shipment, but this is not guaranteed. A confirmation email is sent once the item leaves our warehouse. If a tracking number is provided by the shipping carrier, we will update your order with the tracking information. Please note that some orders may not have tracking numbers. The rate charged for the shipping of your order is based on the weight and dimensions of your products, and your location. Before the final checkout page you will be shown what the cost of shipping will be and you will have a chance to not place your order. ArtYogi reserves the right to change its shipping practices. If such changes occur, this Shipping Policy will be updated. Users should check back periodically to confirm the then-current terms of this Shipping Policy. This Shipping Policy is not intended to and does not create any contractual or other legal rights in or on behalf of any party. This policy applies only to products and services purchased directly from ArtYogi, Inc. (ArtYogi). While ArtYogi offers products and services purchased directly from Artygoi on our site, there are many third party vendors who also offer products and services on our site (3rd Party Vendors). 3rd Party Vendors are also referred to as Sellers throughout our site. When an order is placed with a 3rd Party Vendor, ArtYogi is not acting as an agent or principal and the contract is made between yourself and the 3rd Party Vendor. Such orders will be subject to the return policies and all other polices which are determined and implemented by the 3rd Party Vendor. If you have a refund, return or exchange request for an order placed with a 3rd Party Vendor, please contact them directly or click my orders or return management on your dashboard and follow the prompts which will appear on your screen. Your item must be in its original unused and unopened condition to be returned, unless the product is defective, as determined by ArtYogi in its sole discretion. You must return the item within thirty (30) days of your purchase. ArtYogi will provide you with a return label for each return. ArtYogi takes pride in its easy return policy. Simply select my orders or return management from your dashboard and follow the prompts which will appear on your screen. You may also contact return department at services@artyogi.com or via telephone at ( ) ___________. A customer service representative will provide you with a Return Merchandise Authorization (RMA) number and return address. We will not return any items without an RMA number. When requesting an RMA number, please provide the following information: customer name, invoice or order number, SKU number, and nature of the problem. All returned products MUST be 100% complete, contain ALL original boxes and packing materials, have original UPC codes on the manufacturer boxes, and contain all manuals, blank warranty and registration cards, CD(s), diskette(s), and other accessories and documentation provided to you with your purchase. If a product is returned because it is defective or the because the wrong product was sent to you (as determined by ArtYogi in its reasonable discretion), at your election, we will (1) replace the returned product (if in stock) with no additional shipping cost to you or (2) refund you the full purchase price, including any shipping costs, taxes, and gift wrapping costs. If the product is being returned for any other reason whatsoever, you will be responsible for all shipping costs whatsoever. For such returns, at your election, we will (1) replace the returned product (if in stock) and charge you for all shipping costs to ship the replacement product and return the product or (2) refund the full purchase price, including tax, less all shipping costs, including the costs to initially ship and return the product, and less gift wrapping costs. To cancel an order you have placed with ArtYogi, you can go to your dashboard and click my orders to learn the status of the order. If the order is still being processed, you may click the option to cancel the order at no cost to you or contact customer support by email at services@artyogi.com or via telephone at ( ) ___________. Every effort will be made to accommodate the cancellation of your order as long as it has not yet shipped. When contacting customer support to cancel an order, please be ready to provide your name, the order number and your contact information. Please note, if the item has shipped, the order cannot be canceled. In this case, you can request to return the item for a refund, but you be responsible for all shipping costs, including the costs to ship the product to you and the costs to return the product back to us. If you would like to exchange your item for a different size or color, you may exchange your item within thirty (30) days of purchase, but you still will be responsible for all shipping costs, including the return of the item. ArtYogi reserves the right to change its return, refund and exchange practices. If such changes occur, this Returns, Refunds and Exchange Policy will be updated. Users should check back periodically to confirm the then-current terms of this Returns, Refunds and Exchange Policy. This Returns, Refunds and Exchange Policy is not intended to and does not create any contractual or other legal rights in or on behalf of any party. When was the product made? 2017 © All right reserved at ArtYogi, Inc.